PRELUDE TO WAR: BLITZKRIEG! 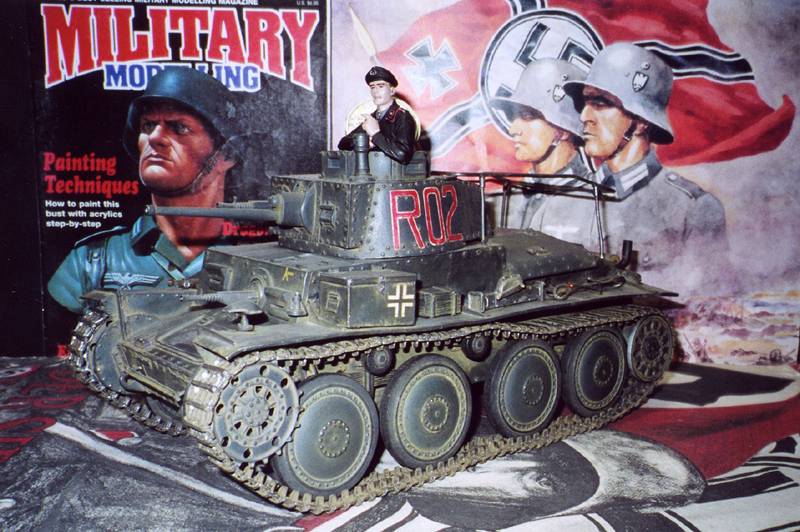 LIGHT PANZER VARIANTS IN 1/15 SCALE. The German Blitzkrieg reached an exhilarating climax culminating in the French capitulation in June 1940. Never has a military campaign ever had such an overpowering effect to feel the shock of the sudden and violent appearance of this new type of warfare that resulted in the most stunning triumph in the history of German arms, an old score avenged; The German conquest of France. With new equipment, combined with a fully defined tactical doctrine and seasoned tank crews made Germany�s armored legions the world�s most formidable assault force. The most famous and numerous Blitzkrieg Panzer was the Czech made Skoda works PzKpfw 38(t). It was an excellent tank, its only drawback was that it was riveted and bolted construction, which proved to be a serious handicap in combat. Later on as the war progressed these light Panzers were soon phased out, only the chassis was kept, (which was the only thing that was worthwhile and reliable) same thing with the PzKpfw II, they disposed of their turrets and salvaged their chassis to use them to mount heavier caliber weapons as self-propelled and Panzerjager vehicles. The origins of World War II was the fact that Britain and France had made it a world war when Germany invaded Poland, Germany was surrounded by international enemies, the annexations of the Rhineland, Austria, and the Sudetenland by the wish of its citizens had provoked international rage, the return of power to the people in Germany so infuriated the Anglo-French Establishments that before 1939 it had unofficially declared war on Germany. Contrary to what one is told, Germany had limited power and was quite alone, how Germany managed to survive these early years defy comprehension, only the fact that Germany based on the principles of self-determination explains its survival against all odds. Germany�s unification of a state was to provide the people and the nation with a political structure free of the petty nationalism of the past, and was to be morally united through class reconciliation and physically united through the return of the lost German homelands, and also made aware of the kinship with all the other Germans living in foreign lands, all Germany representing an ethnic unity. It has always been Germany�s policy to oppose the ideology of class war with an ideology of class cooperation. For Germany the failure of class war made class cooperation the only just alternative. To make it work Germany saw to it that one class would not be allowed to abuse the other, Germany had witnessed and experienced the benefits of class cooperation. Germany spelled out its formula of class cooperation as the answer to Capitalism and Communism with these words: �Class cooperation means that the Capitalist and the Communist will never again treat the workers as mere economic components, money is but one part of a nations economic life, the workers are more than machines to whom one throws a pay-packet every week, the real wealth of a nation is its workers�. Germany replaced gold with work as the foundation of its economy. If so much hatred was generated against Germany by the international bankers and the servile press it was because of Germany�s Social Revolution. It was obvious that a genuine popular movement like Germany�s Social Revolution was going to collide with the selfish interest of high finance. Germany made clear that the control of money did not convey the right of rapacious exploitation of an entire country because there are also people in the country, millions of them, and these people have the right to live with dignity and without want. And it was this Social Revolution that Germany felt compelled to spread throughout the German Reich and defend with their lives if need be. The Treaty of Versailles had separated the German city of Danzig from Germany and given it to Poland against the wish of its citizens. This action was so outrageous that it had been condemned all over the world, a large section of Germany was sliced through the middle, to go from western Prussia to eastern Prussia one had to travel in a sealed train through Polish territory. The citizens of Danzig had voted 99% to have their city returned to Germany, their right of self-determination had been consistently ignored. However, the war in Poland started for reasons other than Danzig�s self-determination or even Poland�s, the unfortunate Poles were railroaded into war by the British, promising them that the governments of Britain and France would immediately invade Germany if Poland was attacked, they never did rush to their rescue. Why? Much has to do with the long standing inferiority complex British and French rulers have felt towards Europe. This complex has manifested itself in the British and French Establishment�s obsession in keeping Europe weak through wars and dissension. At the time the British and French empires controlled 500 million human beings outside of Europe in colonial rule but somehow it was more preoccupied with its traditional hobby: Sowing dissension in Europe. This policy of never allowing the emergence of a strong European country has been the British and French Establishment�s modus operandi for centuries. Whether it was Charles the Fifth of Spain or William the Second of Germany, the British Establishment never tolerated any unifying power in Europe. Germany never wanted to meddle in British affairs, however, the British Establishment always made it a point to meddle in European affairs particularly in Central Europe and the Balkans. For Germany, the Europe of petty jealousies, jingoism, border disputes, economic rivalries, was of no interest, it was to petty and demeaning, that Europe was no longer valid for Germany. Germany�s eastward expansionism however, created much outrage: How could the Germans claim land eastward? To this one can answer: How can France claim southern Flanders and Rousillon from Spain? And what of Britain, and what of so many other countries who have claimed, conquered, and settled in other territories? Somehow at the time it was alright for all these countries to settle foreign lands but it was not for Germany. Germany�s entry into Prague brought the British running to the fray, Prague and Bohemia as well as the Sudetenland had been part of Germany for centuries and always within the German sphere of influence, British meddling in this area was totally unjustified. For Germany, Prague was a watchtower to central Europe and an advance post to delay Soviet invasion. There was also Prague�s historical economic links with Germany, Germany has always had economic links with central Europe. Rumania, the Balkans, Bulgaria, Hungary, and Yugoslavia have had long standing complimentary economies with Germany which have functioned to this day. Germany�s European economic policy was based on common sense and realism, and it was Germany�s emerging central European common market rather than concern for Czech freedom that the British Establishment could not tolerate. The British Establishment, fearful that Germany�s success could spread to other counties, was determined to destroy it. It created hatred against Germany across Europe by stirring old grievances. It also exploited the envy some Europeans felt towards Germany. In science and technology Germany was ahead of both France and Britain, Germany had been built into an economic powerhouse, that was Germany�s crime, and the British and the French Establishment opted to destroy it by any means. It was under these appalling circumstances that the origins of World War II started, a war that was born by the Treaty at Versailles.